Whether you're entering or just spectating, this is your chance to see some pretty fine pieces of machinery. 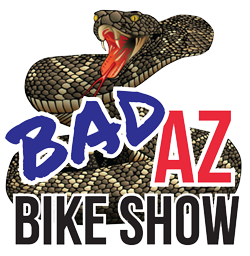 Stop by the RockYard and take a look at all the "BadAZ" bikes! General Rules: All bikes must be operable and licensed. Contestants are responsible for choosing the correct class. Bikes must be ridden into the bike show area. First place in each category will receive a trophy and $200. Second place will receive a trophy. Best of Show will receive a trophy and $500. SPORT - Also known as the Crotch Rocket class. Bikes in this class are built for performance and handling. MODIFIED - This includes a wide range of bikes from any major manufacturer with frame modifications. BUILDER - This class is ground up, one off bikes. They can be bikes from any builder or personally built. TOURING - This class is not available in this show. Contestants with these models must enter the Baddest Bagger Bike Show. VINTAGE - 1969 and earlier; all makes and models welcome. Restored or unrestored originals, choppers, modified, customs, all are included. CLASSIC - 1970 thru 1985; all makes and models welcome. Restored or unrestored originals, choppers, modified, customs, all are included. TRIKES AND SIDECARS - Anything with three wheels, including sidecars. All bikes will be categorized into the eight classes listed above and judged by a selected panel judges. Disclaimer: The classes will be judged solely on the personal preferences of the judges. We've done our best to find these awesome volunteers who have been around bikes for some time. They have been encouraged to use an open mind and their own eye for details. No points may be awarded and no score sheets will be made available for review by contestants.